For as long as humankind has been cooking and eating, illnesses from contaminated food has occurred. Our country has several regulatory agencies seeking better ways to avoid or reduce such occurrences, but still, several times each year we hear again of some foodborne contagion sickening and killing. Most folks assume that meat and poultry products are most susceptible to infectious contamination but that suspicion would be wrong, according to a recent joint report from the Centers for Disease Control and Prevention (CDC) and the Interagency Food Safety Analytics Collaboration. The agencies analyzed data from nearly 700 outbreaks of foodborne illness caused by either Salmonella, E. coli O157:H7, Campylobacter or Listeria between 1998 and 2012. Surprisingly, vegetables were responsible for the greatest number of illnesses and most of those were due to Salmonella and E. coli. If the illnesses from fruits were added to those from vegetables, the total substantially outweighed those from meat and poultry. 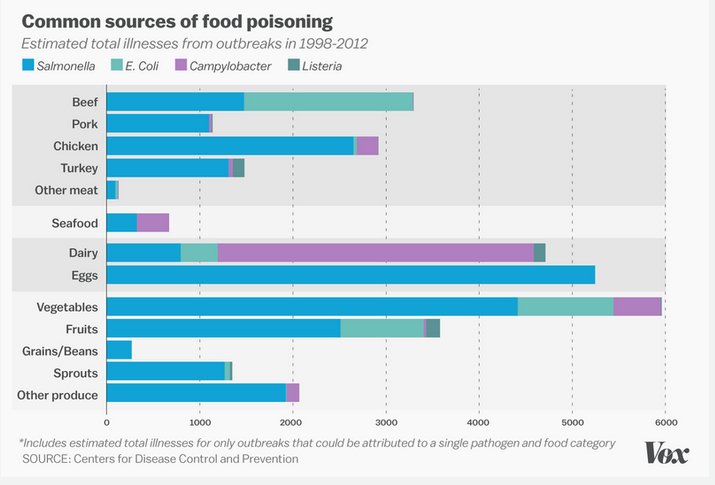 Poultry-sourced illnesses were almost exclusively caused by Salmonella, as were those due to consumption of eggs (see graph below from VOX). Beef and pork caused illnesses mostly from Salmonella as well, with beef also being a source of E. coli contamination. As we have written extensively, commented ACSH s Dr. Ruth Kava, foodborne illness can certainly have serious health consequences, especially for the very young and old, and for those with compromised immune systems. But it s not very hard to prevent these illnesses. The key is to be careful in handling and preparing foods especially those to be eaten raw. Careful washing of fruits and vegetables, separation of cooked and raw foods, and avoiding consumption of raw eggs and unpasteurized dairy products will go a long way in keeping consumers healthy, she continued.